“Oh the ship set out from England, and they were not far from shore. On April 15, 1912, almost exactly 100 years ago, the RMS Titanic sank on her maiden voyage, after colliding with an iceberg in the North Atlantic. She carried 2,223 passengers, among whom were some of the wealthiest people in the world, accommodated in unbelievable luxury in the upper parts of the ship. Available for the pleasure of the first class passengers were a gymnasium, swimming pool, libraries, luxurious restaurants and opulent cabins. Meanwhile, below, crammed on the lower decks below the water line, were about a thousand emigrants from England, Ireland and Scandinavia, seeking a new life in North America. The Titanic carried only lifeboats enough for 1178 people, but the ship had so many advanced safety features that it was thought to be unsinkable. Why does the story of the Titanic fascinate us? Why was an enormously expensive film made about it? Why has a cruse ship recently retraced the Titanic's route? 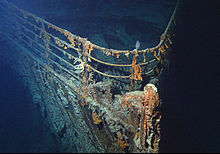 I think that the reason for our fascination with the story of the Titanic is that it serves as a symbol for the present state of modern society. We are all in the great modern ship together. On top are the enormously rich, enjoying a life of unprecidented luxury, below the poor. But rich and poor alike are in the same boat, headed for disaster – surrounded by the miracles of our technology, but headed for a disastrous collission with environmental forces, the forces of nature that we have neglected in our pride and arrogance. “...loss of contact with reality, and overestimation of one's own competence or capabilities, especially when the person exhibiting it is in a position of power...”? Can we recognize this today? I think that we can. 1. Adams, Simon, “Eyewitness, Titanic”, DK Publishing, New York, (2009). 2. Aldridge, Rebecca, “The Sinking of the Titanic”, Infobase Publishing, New York, (2008). 3. Cairns, Douglas L., “Hybris, Dishonour and Thinking Big”, Journal of Helenic Studies, 116, 1-32, (1966). 4. Fisher, Nick, “Hybris: a study in the values in honour and shame in ancient Greece”, Aris & Phillips, UK, (1992).